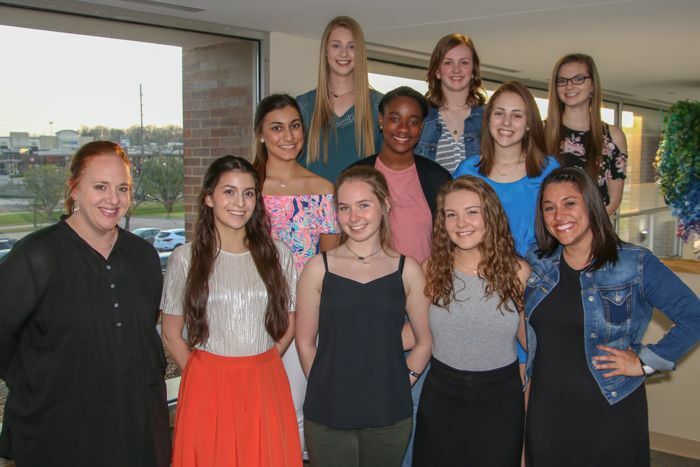 Read about the students and staff who were recognized at the April 24 Board of Education meeting. Several students from Pattonville earned honors after competing in the Missouri National Education Association’s Dr. Martin Luther King Essay and Poster Contest. At the state level, the following students were recognized with honors. In the kindergarten and first-grade category, Elizabeth Peterman from Bridgeway Elementary School placed first and Riley Binggeli from Remington Traditional School placed second. Remington’s Devin Garner placed second in the third- and fourth-grade category. In the fourth- and fifth-grade category, Ashton Hulbert and David Dunn from Bridgeway placed first and second, respectively. In the middle school category, Remington students Meredith Stroud, Alyssa Koller and Holly Jones took first through third places, respectively. Prior to the state level, students competed within Pattonville to select district honors. The following students earned recognition in the Pattonville competition. In the kindergarten and first-grade category, Remington’s Braden Edwards placed third. In the fourth- and fifth-grade category, Remington’s Audrey Dallape placed first, Missy Small placed second and Xander Willingham placed third. In the middle school category, Remington’s Helina Birhanu placed third and Ayiana Baynes from Holman Middle School placed fourth. Remington students Mariah Canada, Allison Schrumpf and Jacob Zarosa tied for fifth. Four students from Pattonville were nominated and named runners-up for the Super Citizen Award. They are second-graders Johnny Behrendt and Quinn Chapman and sixth-graders Abby Evers, all from Remington Traditional School, and Mercades Zumwalt from Holman Middle School. The award, sponsored by the Missouri Valley Conference and Newspapers in Education, recognizes outstanding student citizens for positively contributing in their school and community, demonstrating respect for the views of others and having an excellent attitude towards education and school life. Members of the Jr. Pirate wrestling team competed at the Missouri AAU State Wrestling Tournament, where five took top honors. In the Schoolboy division, Pattonville Heights Middle School seventh-grader Rickson Taylor placed first in the 145 weight class and was named a triple crown winner after placing first at state, the Missouri Challenge and the Ozark District Championship. Also in the Schoolboy division, Paulie Palermo, a sixth-grader at Heights, placed fourth in the 152 weight class. In the Cadet division, Heights eighth-grader Daniel McCoy placed first in the heavyweight class and Remington Traditional School eighth-grader Bryce Killian placed fourth in the 95 weight class. In the Midget division, Bridgeway Elementary School fourth-grader Matthew Judge placed fourth in the 92 weight class. Kirk Janitch, Casey O’Brien and Eric Thomas coach the Jr. Pirate team. Junior Shaleen Gupta was accepted into the Kennedy-Lugar Youth Exchange and Study Abroad program. She will spend the next school year in Indonesia. The exchange program, sponsored by the U.S. Department of State, Bureau of Educational and Cultural Affairs, offers full scholarships to 65 students each year to study for a year in countries with high Muslim populations. Senior Madelyn Hubbs was selected as honorable mention in the 2018 Missouri Scholars 100, a statewide program that honors 100 of Missouri’s top academic graduating students. Selection is based on a formula that uses a student’s grade point average (GPA) and ACT or SAT score and an academic decathlon that consists of 10 events, including being an exemplary citizen, taking upper-level courses and being ranked in the upper 10 percent of their class. Five of Pattonville’s HOSA Future Health Professionals (formerly known as Health Occupation Students of America) are advancing to the international competition this summer after earning honors at the HOSA Missouri State Leadership Conference. They are Will Polster, who placed first in the researched persuasive writing and speaking event, and Sarah Baker, Evan Clark, Caleb Hughes and Tabitha Wilkerson, who placed third in the HOSA Bowl. In addition, Mario Jauregui competed and placed fifth in the dental terminology event. Additional students who competed at state were Teidrick Banks, Mikayla Bridges, Victoria Lofland, Josh McKinley, Meaghan Pace, Maria Serra and Sam Vaclavik. They are coached by teacher Jamie Jobe. Senior Katie Basta was named the Post-Dispatch Scholar Athlete for Pattonville. Those selected for the Scholar Athlete award are nominated by a head coach and voted on by all of Pattonville’s head coaches. Basta named All-Conference First Team in softball and also competes in basketball and track. The Pattonville High School varsity drill team placed third in the small hip hop division and 12th in the medium pom division at the National Dance Association (NDA) national championship in Orlando, Florida. Team members are Erin Bailey, Brittany Bell, Allison Brown, Isabel DiSalvo, Amaris Kirksey, Bianca Lee, Renee Neal, Summer Parker, Emily Reyes, Hannah Schamber, Maria Serra, Hailey Sparacio, Lacey Swanson and Chrystian Taylor-Vaughn. Their coaches are head coach Grace Burgos and assistant coach Katie Funderburk. On the girls basketball team, Tyra Brown was named All-Conference First Team. Jalyia Smith was named All-Conference Second Team. Kendall Battle and Kelsey Mack were named All-Conference Honorable Mention. The team is coached by teacher Doug McGhee with the assistance of Kaitlin Childs. On the boys basketball team, Derrick Boyce was named All-Conference First Team. Michael Jackson was named All-Conference Honorable Mention. Ezra Jakob was selected for the All-Conference Sportsmanship Award. The team is coached by Kelly Thames with the assistance of Antonio Bryant, Travis Harris, Jason Ohlsen and Dominic Varner. On the wrestling team, Omar Daoud was named All-Conference First Team. Imran Alvi and Darkari Streeter were named All-Conference Second Team. Peter Collier was selected for the All-Conference Sportsmanship Award. The team is coached by Brent Mueller with the assistance of Jake Kim, Mike Moeller and Michael Oostendorp.